Episode 9: Get Ready to Take Local Action — What Would Alice Paul Do? 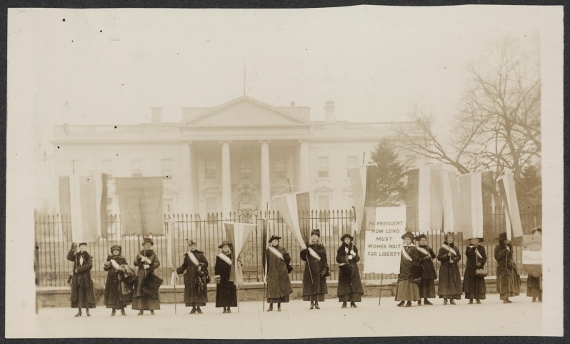 Suffragists picketing in front of the White House in 1917. (Harris & Ewing/Library of Congress). Learn more about "Alice Paul's Enduring Legacy of Nonviolent Action." When you can speak "for the League"
Find out how this issue affects your community. Do research of League positions and other advocacy activities taken. Put together a list of common concerns about this issue. Learn about challenges and successes that previous efforts have faced. Make talking points to get you started, and use language from action alerts. Go to LWVUS action alerts or your state league’s action alerts. Join forces with a group already working on this issue. Let your elected officials know how you feel. Attend lobby day or rally. Research which level of government to contact. Provide your contact info and the bill number. Be clear with your position. Be prepared to counter opposing argument. Encourage them to reach out if they have questions. Flood the scene with your message. Let your organizational partners know you are working on this issue. Post alerts on websites and social media.